Let's get the inessentials out of the way first. The performers' use of the "new critical edition - edited by 'Boccaccini e Spada editore'" is hardly a drawing card, save perhaps for a handful of musicologists. We simply don't hear this music frequently enough to be aware of such niceties. Then, Danilo Prefumo, in the booklet, makes much of the use of the large-orchestra scoring of the E minor concerto - there exist also a flute-and-strings edition and a flute-quartet chamber version. The climactic tuttis certainly make a grand sound; but both here and in the E major concerto, scored for a similarly proportioned ensemble, the strings continue to carry the bulk of the musical freight, as they would in a smaller orchestra, with the winds relegated to a supporting role. So why should you hear this record? Well, the music is beautiful, which is probably the best reason. We know Mercadante in the opera house as a budding bel canto composer. His cantilenas are perhaps less appealing and pliant than, say, Bellini's, but lovely, while the virile, martial cut of his ensembles foreshadows early Verdi. 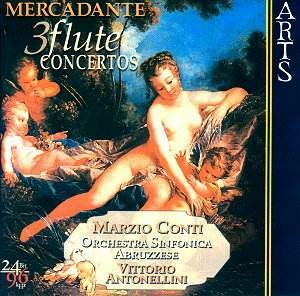 Both styles are amply present in these concerti, which infuse rigorous Classical structures with the expanded expressive range of the dawning Romantic period. The poised, deceptively artless cantilenas of the central slow movements explore layers of ambiguous emotion. Conversely, the final Rondo russo of Op. 57, with its strongly-marked gypsy rhythms, and the bouncy Polacca finales of the other two scores, are all pleasingly infectious. Marzio Conti is also worth getting to know. The stereotypical flute sound, all too familiar even in some professional orchestras, is breathy, chiffy, and occasionally sharp in pitch. Avoiding this, more accomplished players, including both Rampal and Galway among famous virtuosi, cultivate a big, round, somewhat hard-edged timbre. Conti's playing avoids both these extremes, offering a distinctive lean, clear sonority, projecting the composer's embellished solo lines with shapely phrasing and a liquid, well-bound legato. In the highest reaches, he doesn't always maintain the legato air stream impeccably (track 2, 1:27), but the tone stays clear and the intonation accurate - the peak of the arpeggio at track 7, 6:58, is "placed" dead in tune. The color change in the descending arpeggios of the E major concerto suggests a singer's register break - an odd effect on the flute, but not an inappropriate one in this operatically conceived style. Only in the D major concerto does Conti's technique falter briefly: the opening broken octaves are careful, and his phrasing is labored in some of the passagework. Otherwise, it's a pleasure to hear such accomplished, individual playing. Presumably his intention in choosing this program was to avoid the overworked Mozart concerti, but now I'd like to hear him play them. The Orchestra Sinfonica Abruzzese respond plausibly to Vittorio Antonellini's leadership, but sustained supporting winds occasionally obscure the faster-moving violin themes in the ritornellos of the D major concerto. The booklet suggests "utilizing a DVD sound carrier and player" for best effect, though the disc isn't explicitly labeled as DVD Audio - just 24-bit/96 kHz "standard" digital. Standard CD playback balances the soloist well against the rather bright-toned orchestra, with ample depth, but some glare in full wind chords as well. The label offers the total program timing as 56.15, but my CD readout indicates it as in the headnote.